Education Automation Now and in the Future. In this talk I recognize Buckminster Fuller as one of the conceptual founding fathers of the Open Educational Resources (OER) movement, detail six of his educational ideas, and give a brief review of several OER courses I’ve taken to indicate the kind of comprehensive education now possible using freely available on-line courses. Synergetics and Model Thinking. In this talk I synthesize Scott E. Page’s Model Thinking with Buckminster Fuller’s Synergetics. I introduce both subjects, then discuss the importance of model thinking. Then I sketch some ideas about how Model Thinking and Synergetics can inform a more incisive approach to science. Please share any thoughts you might have about these presentations in the comments. I would value your feedback. For the past couple of years, Jeannie and I have been engaged as students using so-called “open educational resources” (OER). We’ve “taken” a number of courses at MIT’s OpenCourseWare (OCW), OpenYaleCourses as well as dabbling in material from numerous other schools around the Internet. I first read Buckminster Fuller’s short book Education Automation many years ago. I was amazed at Fuller’s foresight in advocating so much of what has now become the OER movement. Then a week ago I led a Ben Franklin Thinking Society discussion on Buckminster Fuller and the Open Educational Resources Movement. Here are my reflections on what I learned from preparing and participating in that discussion. During the discussion, I asked participants if they had used any OER materials. Many of them had not. 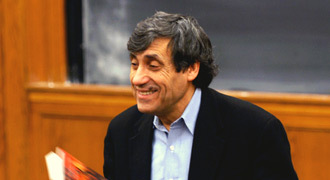 But I was excited to learn that one of the participants studied Linear Algebra with video lectures by Gilbert Strang. Jeannie and I put more time into that excellent course (even doing all of the homework, quizzes, and two and a half final exams) than any other OER course we’ve worked through. As a self-learner, one of the most important elements of OER courses to me is that I can choose how to use the materials (unlike in school where one is more or less told what to do). For example, there are some courses where I just want an overview or a feeling for the subject, but I may not need to master the material. Like when we studied Introductory Biology at MIT’s OCW, we watched the videos and only briefly looked at the lecture notes. We skipped the homework and the tests. We quickly ignored the parts that were not, at that moment, of interest. I think this is a big improvement over school where I frequently suffered from wanting to go into more depth than the course in some parts and less depth in others. Using OER I can get the education I want, when I want it! It should be noted that the OER movement has been partly inspired (according to this good review article on open educational resources in Communications of the ACM) by the FOSS (Free and Open Source Software) movement. I find this fascinating since I have long been involved in the FOSS / Linux world (I’ve written about that extensively in the managing FOSS blog). Fuller’s global vision has foreseen elements of both movements. To find out more about OER, the wikipedia entry http://en.wikipedia.org/wiki/Open_educational_resources can get you started. 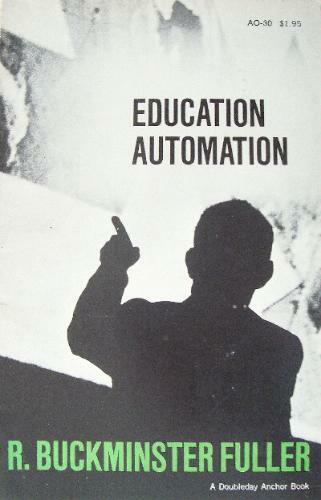 To prepare for the Ben Franklin Thinking Society discussion, I re-read Education Automation twice. That led to these five quotes on Bucky’s thinking on education including how he foresaw elements of the OER Movement. The quotes and my commentary expand the discussion to address some broader issues in education as well. The quotes are all from Education Automation which was published way back in 1962.